Projects such as the High Line in New York have used industrial spaces to create wildlife havens in the heart of the city. It's a trend that's spreading around the world. So how can you connect with nature on your own patch of turf? It's a tiny slice of forest in an urban landscape. Hawthorn and crab apple trees provide a shady canopy over a collection of shrubs, wildflowers and grasses. The garden, London Glades, at the Hampton Court Flower Show, is designed to mimic the forest floor. Mounds of rotting wood and garden waste have been covered with topsoil to be more sustainable and echo the natural contours of the wild. 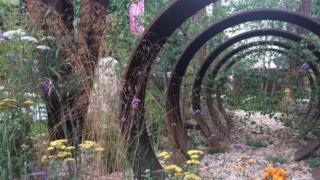 Jon Davies of Future Gardens London says the garden sets out to explore a deeper relationship with nature. "One of the main things we're working with is Hugelkultur, which in German means hill culture," explains Jon. "It's the idea of creating mounds in the ground, so contouring the land rather than just having it flat." He says the contours create interesting planting environments for different plants. "We're trying to get a Hugelkultur revolution going on, especially in the urban environment, and saying, 'Look, your gardens don't have to be flat,'" he explains. "We can create these really cool contours, which create really interesting planting environments." Part of the concept of the garden is to invoke the senses. Strawberries nestle among other plants, where you can reach out and pick them. There's moss to tickle your toes if you walk barefoot along soft paths. "We're trying to get people to get all their senses involved when experiencing this garden," says co-creator Andreas Christodoulou. "So there's an edible element to every plant and so therefore you can taste what the plants are like. "There's a lovely smell, especially during the rain, along the lawn paths, and we encourage people to take off their shoes as they walk through so that they can feel and try to explore the soft landscaped paths." Plants are chosen for their textures and flowers, while the trees create dappled light and shade. The overall effect is soft and wild, rather than the straight lines and manicured lawns of traditional gardens. "We want to try and get a feeling of nature, and the woodland and the wildness into an urban setting so you feel very connected in a deeper way to the natural environment," says Jon. Martyn Wilson from Wilson Associates Garden Design is behind a garden that echoes the way nature takes over abandoned industrial spaces. "The concept is around the regeneration of brownfield sites as they're known," he explains. "My inspiration is from places such as the High Line in New York and the Landschaft Park at Duisberg in Germany, but also major regeneration sites such as the former MG Rover site in Longbridge in Birmingham." Sculpted steel forms the basis of the garden, together with concrete blocks. The planting includes birch trees, buddleia bushes, grasses and ferns. "I'm of the view that people perhaps walk past these spaces," says Martyn. "They perhaps don't look through the hoarding and see what's going on inside. So I'm hoping people will look at these sites and hopefully see the beauty of them. " Old factories and industrial spaces can go through periods of transition where they are reclaimed by nature. Even a small patch of land of 9 by 5 metres can harbour wildlife. Plants peep through gravel as if they have sprung up naturally, attracting insects such as damselflies. "This is in essence a gravel garden - it's low maintenance... and if you're wanting to encourage wildlife it's very pollinator beneficial," says Martyn.